Wishing you and yours a Merry Christmas! Having a roast pig for Christmas Eve/Christmas – lechón – is a major tradition in Puerto Rico and Cuba, and it is one of our favorites. Consequently there are many songs that extoll the virtues of the humble pig. In honor of the lechón-filled holiday, here’s one of our favorite Christmas lechón songs: “La Fiesta de Pilito” by Puerto Rico’s stalwart musical group. El Gran Combo. We hope you are having a delicious holiday – maybe with some lechón! Rincon Criollo (6504 Detroit Ave, Cleveland, OH) reminds us of home. This kind of restaurant serving Latin American or Caribbean food can be found in nearly every neighborhood in Chicago, so we felt right at home in this Cleveland mom and pop place. The food at Rincon Criollo is Puerto Rican, and it serves a menu of island favorites at reasonable prices. We arrived on a Friday night (note that they close at 8 PM) and the place was full of families and couples ordering takeout. The menu focuses on meat-heavy dishes like roast pork, roast chicken, beef stew and pork chops with sides of rice and beans (all less than $10). Rounding out the menu is a selection of sandwiches and a huge variety of traditional sides including maduros and tostones (fried savory or sweet plantains). We took a bit of an extended writing break around Christmas and New Years this year, but never fear, there are still a few more days to get in those holiday recipes before people think you are out of step (we still have our Christmas lights on!). One of the holiday recipes we enjoyed over our break, at a Puerto Rican parranda (caroling event), was coquito. Coquito is a Puerto Rican coconut eggnog, often served spiked with rum. In Puerto Rico the winter holiday season extends well into January, and coquito can be found at any holiday feast during this time. Coquito is super easy to make – and maybe it will make the transition back to work a little easier. Pretty much the last place we expected to find awesome mofongo was in a small town outside of Cleveland, named “Campus Grille,” but we did! Campus Grille (10 Seminary St, Berea, OH 44017) is hiding in plain site with a nondescript name and facade in the small town of Berea, near the campus of Baldwin Wallace University. We came here specifically for one of our favorite Puerto-Rican dishes, mofongo, but were pleased to find a varied Caribbean menu. Campus Grille is a casual place, which seemed to be popular with college kids and families alike. You place orders at the counter and then they are delivered to your table. We knew we had to order the mofongo since we had heard so much about it, and once we saw the pilón (wooden mortar and pestle) for making mofongo we knew it was going to be good! We ordered a roast pork mofongo ($11.50 – other options include plain, chicken, beef or shrimp), and the house special, coco tropical ($9.50), which is roast chicken over a bed of coconut rice and spicy pineapple chutney, and a side orders tostones – fried plantains ($3.69). Also on the menu are beef stew (carne guisada), a cubano sandwich, rotisserie chicken, and even a vegetarian plate. If you are there for lunch, the specials seemed like an amazing deal at $6. With our Jarritos fruit sodas in hand we waited only a short while for the food to arrive (there were a few tables outside, too). Both dishes were excellent, and the proportions were huge. 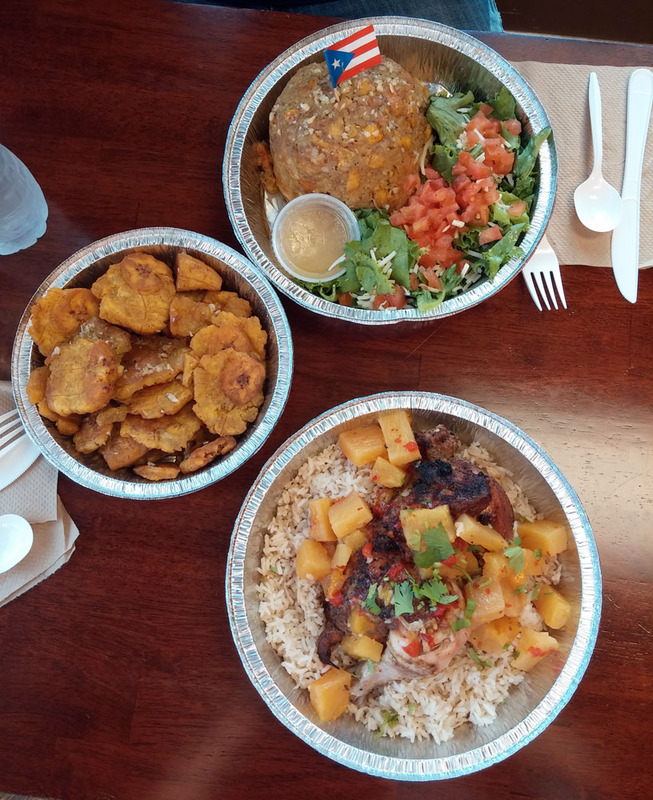 The mofongo was excellent, and the pork was tender and well spiced, the plantain portion was flavorful and garlicky, and not mushy, which is how we like our mofongo. The coco tropical was delicious, the rotisserie chicken was tender and flavorful, and it would be perfect for those with something a bit more sweet in mind. I think Campus Grille knows that you probably aren’t going to finish your entrée, because they serve everything in round foil to-go containers from the start, and if you don’t finish you can get the plastic lid at the counter. I can see how some people would not like that, but we thought it was kind of genius. Unfortunately, we were not up for dessert, but the flan and tres leches cake looked pretty good, too. We really enjoyed our meal at Campus Grille, it had a lot going for it: great pork, Goya products for sale by the counter and Prince Royce on the radio! Most importantly, this was some of the best mofongo we have had outside of Puerto Rico. 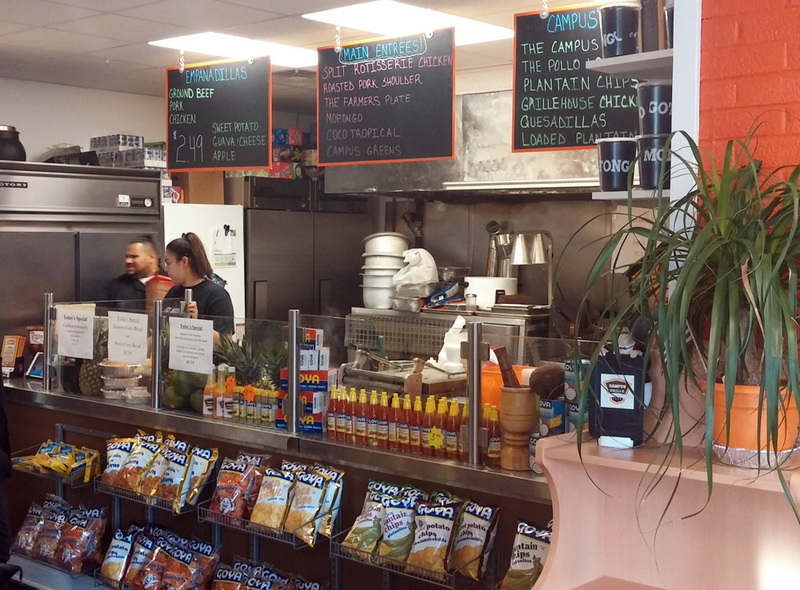 We were so happy to have found Campus Grille, and are excited to explore more Puerto Rican food in Cleveland. Do you have any recommendations for us? We first ate an ensaimada, a sweet eggy, yeast roll on a warm day in Puerto Rico, not knowing anything of its history, other than that it looked pretty tasty (it is actually called a Mallorca there). However, we did not put two and two together until we stumbled upon the same sweet yeast roll, with the same spiral top, on a cold winter day in Madrid, except this time it was called an ensaimada. When we got home, we did a little research and sure enough these two rolls, encountered an ocean apart, were actually the same pastry. Ensaimadas originated on the Spanish island of Mallorca, and gained their name from the pork fat used to make them, saïm. The pastry traveled with the Spanish around the world, and throughout the centuries have found their way throughout the Spanish speaking world to Puerto Rico, and to the Philippines, where they are particularly popular. Ensaimadas, due to their richness, are popular to eat around Mardi Gras time, before all the sweets and butter are given up for Lent, so why not whip some up now? Check out this Spanish-style recipe from Delicious Days, or a traditional Cabell d’àngel pumpkin jam-filled version from the Gusty Gourmet. Jun-blog has a recipe for Filippino ensaimadas, which are miniature-sized and made with butter. 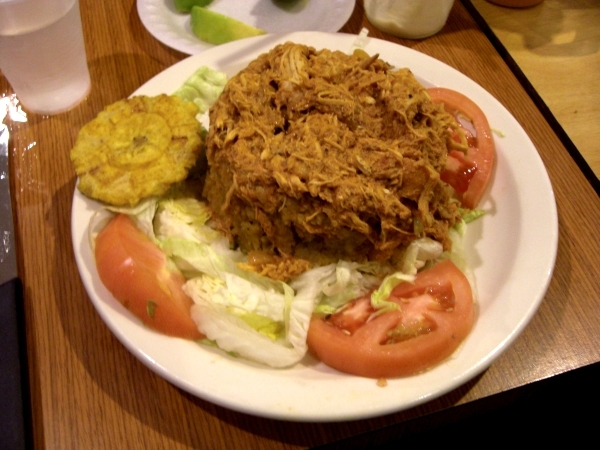 We love our mofongo, and we are grateful that Chicago has a bunch of great Puerto Rican restaurants. Despite its deliciousness, Puerto Rican cooking flies a bit under the radar in the US. However, we have grown to love it and are looking for a good basic cookbook. Apparently much like Joy of Cooking for the US, Puerto Rico has an iconic tome, Cocina Criolla, by Carmen Valldejuli that has pretty much every recipe you need to know. This Puerto Rican classic has inspired journalist Von Diaz to get in touch with the soul of Puerto Rican cuisine by cooking her way through it, a la Julie and Julia. Several locations – we visited 2700 N. Miami Ave.
We first had mofongo in Puerto Rico in 2008, and haven’t had it many times since. So when our Miami local friend suggested a good place to get mofongo in Miami, we were sold. Jimmy’z (named after proprietor Jimmy Carey), located in the trendy Wynwood neighborhood of Miami, is bright and modern with ample outdoor seating. The menu is a little more upscale and pricier than you might expect at a place where you order at the counter (some entrees over $20), and the food is later brought to your table. The menu at Jimmy’z has something for everyone. For a quick bite, there were a wide selection of panini and other sandwiches, including a cubano and seared ahi tuna. There are even substantial entrees covering both Latin and American cuisine like pollo guisado and cajun ribeye if you are really hungry, and a big range of salads if you are trying to be “good.” We had the tomato and mozzarella salad to offset our mofongo and it was delicious! However, what we had been hearing raves about was the mofongo, the quintessential dish of Puerto Rico made from mashed plantains and garlic. Honestly, we were a little skeptical since the restaurant seemed to be doing the whole Pan-Latin and euro sandwich thing. However, we were assured that the mofongo was the real deal. There were 6 kinds of mofongo available: mixed seafood, fresh fish, churrasco, pork in mojo sauce, chicken and shrimp. We ordered the pork mojo mofongo, since M can never pass up a roast pork dish, and split a little of the churrasco with our friends. The price, $17, was a little high, but it was more than enough to feed two hungry people. The pork was tender and flavorful and it was chock full of plantains. It was still had some substance to it, not too mushy. They weren’t lying, this mofongo was delicious. Everyone at our table got mofongo so it was fun to try all the different kinds, though we still think the pork mojo was our favorite. Contributing to the party atmosphere, there is also an ample beer and wine selection, including a lot of import bottles, which were a hit. On a nice night, the outdoor patio was particularly festive. Jimmy’z was awesome for mofongo, and it gave us the hankering to go back to Puerto Rico, ASAP! When we went to San Juan, Puerto Rico, one of our favorite places to eat was the stalwart La Bombonera, an excellent place to grab a pastry and while away the time. Unfortunately, it has come to our attention that it has recently closed! There was talk of re-opening but it seems unlikely. Sad day for pastry-lovers in San Juan. It’s Christmas Eve, and most people have their menus well-planned. But if you need some last minute inspiration, look no further than the typical Puerto Rican Christmas feast. Our favorite part? Lechon asado as the main centerpiece: a whole roast pig, which we try to get as often as we can! Other typical Christmas Eve or nochebuena dishes are pasteles (filled masa steamed in banana leaves), arroz con gandules (rice and pigeon peas) and coquito (coconut egg nog). Though Italian food is near and dear to our heart, this kind of feast is a definitely a close second! Fresh from a scintillating bomba performance (complete with vejigantes!) at the Puerto Rican Arts Alliance‘s “Loíza in Chicago,” we realized, as we so often do in this wonderful city of ours, that we have neglected on of its great culinary traditions. 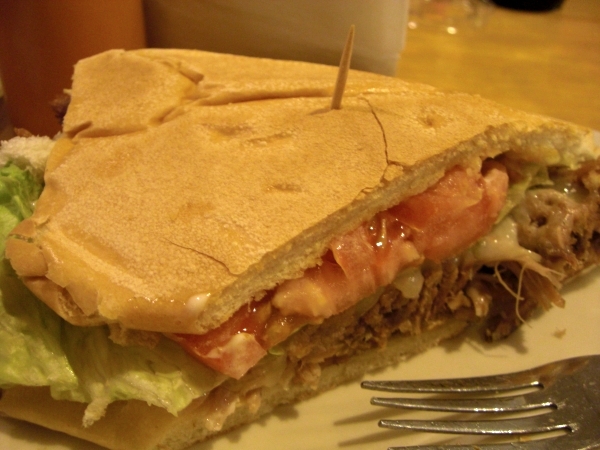 While Humboldt Park, the epicenter of Chicago’s thriving Puerto Rican community, possesses a large number of Puerto Rican restaurants and eateries, we had never before tried a jibarito, a sandwich (usually filled with beef or chicken) dressed with garlic-mayo between a “bun” of fried green plantains. The jibarito has one of those origin stories that sounds made-up, the common “I just decided to do this one day and then it took off” tale, but apparently this time it is true: in 1996, Juan C. Figueroa, proprietor of Borinquen Restaurant in Humboldt Park, invented the sandwich after being inspired by reading about a similar idea in a newspaper. So where to go to get one of these delectable Chicago delicacies? La Plena? La Palma? To Borinquen, its origin? In time we will likely try all the jibaritos we can, but for now, we went with the recommendation of friends and ended up at a beloved hole-in-the-wall: Papa’s Cache Saboroso. With just a few tables, a brisk take-out service, and an ordering counter decorated like a beach food shack, Papa’s dispenses with any formalities to feature high-quality, tasty, and well-price Chicago-PR fare. L, of course, got the chicken breast jibarito. Marinated chicken breast, mayo dressing, tomatoes and lettuce, all featured on the signature fried green plantains, with a side of rice. We love fried plantains anyway, but we were surprised at just how well they work as a sandwich. Firm enough to hold everything together, they still provide a great flavor profile compliment to the rest of the meat and veggies that you just can’t get from regular bread, or really any kind of bread. Just great. Meanwhile, M had a conundrum on this particular Saturday. Go with the jibarito – really, the reason we came – or go for broke and get the Saturdays-only special, the lechon asado, a seasoned roasted suckling pig that is one of the competitors for national dish of Puerto Rico (some mofongo-lovers may take offense). If there is one thing we have learned about M in this blog (besides the love of spicy food) it is that he will stop in his tracks if roasted or smoked pig is anywhere in the vicinity. As was the case here. Lechon asado, like all great pig roasts, takes a while to make: the menu says “This dish takes so much love and attention you can only get it o Saturdays!” It may be true – a crispy, flavor-kicking crust on the outside and pull-apart meat on the inside. While this version was a tad on the dry side for our tastes, the sweet plantains and salad on the side provide a nice way to cut across all the flavors. Finish with beans and rice, and this is a great way to spend a Saturday. While we loved our jibarito and will definitely be back, no need to not experiment further. If you’re having trouble making up your mind, Serious Eats Chicago may be able to help with their list of the Top 10 jibaritos in the city. If there is one thing we love, it is solving (or attempting to solve, as the case may be) enigmatic food mysteries from around the world. Among the most elusive foods we have learned about recently is the granito, a canoe-shaped Puerto Rican rice flour fritura, stuffed with cheese. As far as we can tell, granitos are found only in the town of Humacao, on the Eastern coast of the island. The preparation is fairly simple and requires few ingredients, which are then eventually fried up into a finished product. Check out Granitos in production in Humacao, or this Granito sideshow from Slow Food Puerto Rico. RecipeLink has a simple-sounding recipe, which we may soon try. However, a RecipeLink poster has stated that the previous recipe is actually for almojabanas, a sibling of granitos. Other posters have commented that almojabanas are not a fair substitute (text in Spanish) and true granitos are stuffed with cheese, and don’t have cheese incorporated throughout. Slow Food PR has some information about how granitos came to be, as told by one Mrs. Bartolo Rodriguez. Apparently, the original recipe for granitos was inherited by her father, Mr. Rodriguez, from Don Vicente Vazquez in the sixties. It was Mr. Rodriguez who came up with the signature canoe shape, and it was his daughter, Mrs. Bartolo Rodriguez, who added the cube of cheese to the center of the granito. On the site they are also referred to as “granos,” Spanish for “grains,” no doubt where the rice-shaped granitos or “little grains” earned their name. You can read the complete story in Spanish on the Slow Food page. Origin nonwithstanding, I still haven’t been able to find an approved recipe for granitos. So can anyone find describe a true recipe for these enigmatic snacks? A quintessential Puerto Rican pastry, Pan de Mallorca is rich, eggy and sweet, not unlike a brioche. 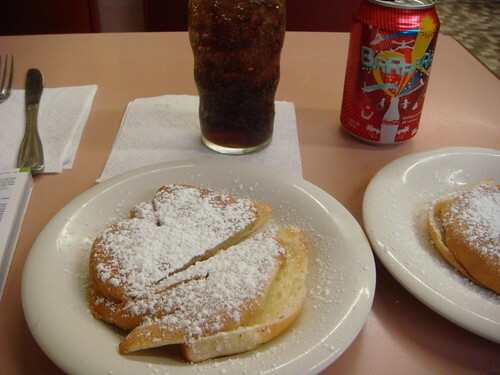 It is typically served as a breakfast or snack, and comes with a dusting of powdered sugar. The snack has almost iconic status in Puerto Rico – but can you make Mallorca at home that rivals bakeries like San Juan’s Bombonera? A visitor to the site recently asked if we knew of any recipes so we decide to rustle a few up. Meseidy at the Noshery has a good recipe, with lovely pictures to go along with the instructions. RecipeLink has an entire thread dedicated to people in search of a recipe like the Bombonera’s. While we ourselves have never tried making Mallorca by hand – it seems like a worthy future challenge. Do you have any Mallorca tips or recipes? Eating Puerto Rico: Snack time! We ate our fair share of heavy, starchy meals in Puerto Rico, but the island has a lot to offer in the way of between-meal snacks. On thing the eaters were really excited for in Puerto Rico was the famous piragua – while it is the Spanish-language word for canoe, it also describes a Puerto Rican snow cone. Little push-carts selling piraguas dot most urban squares in Puerto Rico. Inside the carts are tubs of shaved ice, and sometimes even giant cubes of ice that the piragua-makers shave to order. The piragua comes in a plastic cup (or if you are lucky, a little paper cone) and is then doused liberally with flavored syrup. Along with typical flavors like cherry, coconut and strawberry, you can get more unusual treats like tamarind, hibiscus and mango. Our favorite experience was sharing a tamarind piragua in the Parque de Bombas in Ponce. Perfectly refreshing for a hot day. In terms of quick bites, we also managed to have some excellent breakfasts in Puerto Rico. A typical breakfast in San Juan consists of café con leche and a pastry, a model to which we subscribed. One of our favorite new dishes to accompany our morning coffee was the mallorca-a hot, buttered, fried pastry with a variety of fillings (ham and cheese, etc.). Think panini, but instead of bread there is pastry. Two of the better breakfast places we found for mallorca were Cafeteria Mallorca and La Bombonera. Both boast impressive pastry display cases and big selections of breakfast and lunch items including American favorites like pancakes and fruit salad. Bombonera is the more historic of the two, going all the way back to 1902 (with a vintage Cuban espresso machine to boot). However, we have to give a tip of the hat to Mallorca for friendlier and speedier service. Indian-Caribbean fusion? Not as crazy as you would think – a number of Caribbean islands have sizable populations of Indian immigrants, which has led to some interesting culinary creations. Tantra, an upscale bar and restaurant in Old San Juan, continues this, although it was pretty obviously created for the tourist crowd. The interior was dark and exotic, decorated with Buddha statues and colorful hookahs, all complemented by generalized Eastern music that was just a little too loud for the relaxed atmosphere they seemed to be playing off of. Sadly, this same dark interior made taking photos of the food a little difficult – but we’ll try our best to paint a good mental picture. M started off with an old classic, Chicken Tikka Masala. For $17, it definitely wasn’t worth it. The food itself was tasty (although a little less saffron would have been nice), but the portions were not any larger than servings you would find at a comparable mainland restaurant for half the price. The dish did come with free naan on the side, thus preventing Tantra from falling into one of the Eater’s big Indian Restaurant pet peeves. L got Tantra Mofongo, a supposedly Indian take on the classic Puerto Rican dish. What they claimed was mofongo had little resemblance to the chicken-filled creation we would sample a few days later. This dish was essentially a tall stack of plantains, mixed with Indian spices and fashioned into an artfully constructed column. Again, the $10 price tag was a little much. We left Tantra feeling moderately satiated, but a little put off by the hipster atmosphere and the overpriced food. Later in our trip we would head to the south side of the island, hitting up Puerto Rico’s other culinary hotspot of Ponce. One of the most popular restaurants in town in Rincón Argentina, specializing in Argentinian beef (hence the big cow on the sign outside). Most of what Rincón serves are parrilladas, meaning just about anything that comes off the grill. 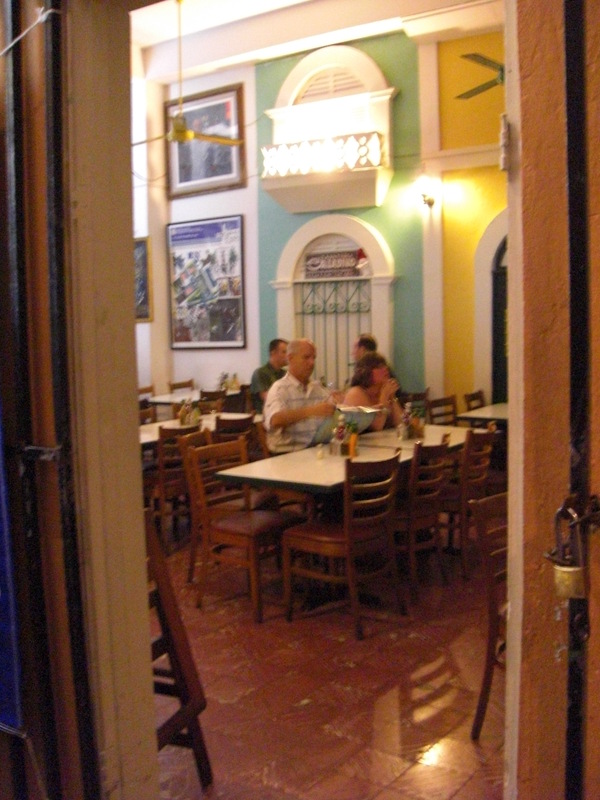 We were seated outside under the cool Puerto Rican evening, ready to dive into our appetizer of plantain fries. Like the skirt steak we ordered later (the house specialty), the dishes came with some great Argentine chimichurri. M had the beef milanesa, which actually turned out a little thin and bland. Overall, we had a similar reaction to Rincón as we did to Tantra – the food was decent, but decidedly overpriced for what we got (about $15 a dish). So overall, our Puerto Rican fusion experience was a little disappointing. Interesting food, but overpriced, especially considering you can get better and cheaper stuff on the mainland. If you travel to Puerto Rico, from our experience we recommend you stick to the tried-and-true local places. The Eaters took a daytrip from San Juan to Loiza, a predominantly Afrodescendant town east of San Juan, known for its colorful mask makers. 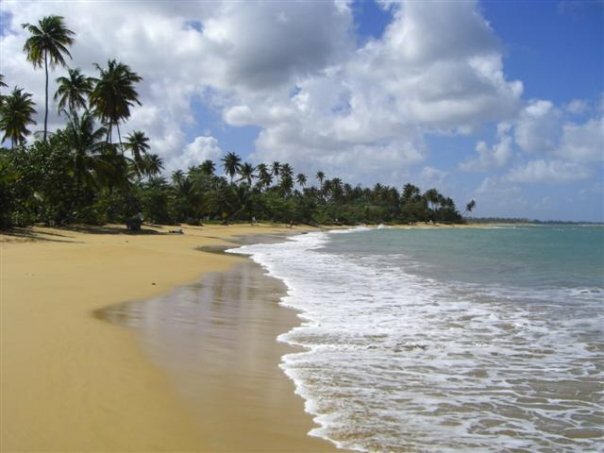 We got a recommendation from the locals to go back west along the coast and visit Soleil, an unsuspecting beachside restaurant with supposedly some of the best food along the ten-mile road between Loiza and the capital. Soleil itself was an appealing but expansive open-air wood structure with two floors and simple tile tables. It was certainly a upmarket take on the typical wooden beachside shack. The menu was, as one might expect, seafood-heavy with a smattering of pasta, meat and salads. 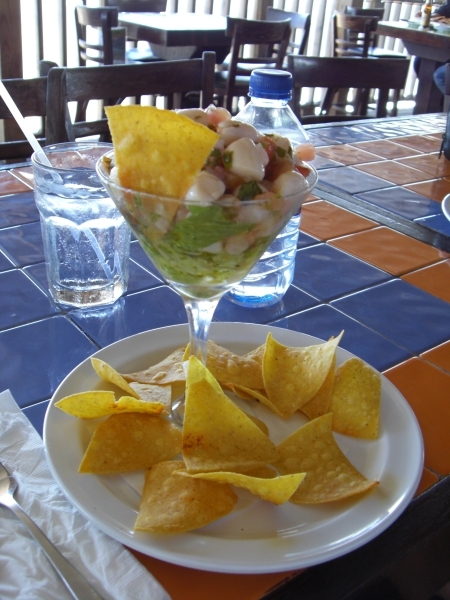 M ordered conch ceviche – one of his favorite dishes. It was served in a martini glass, garnished with tomatoes, lettuce, and tortilla chips. M is more used to the really acidic juices they use for Peruvian ceviche (his all-time favorite), so the more tame acid levels in Soleil’s disappointed him a little, but the dish was still good. The conch was perfectly prepared into nice little bite-sized morsels, and the tortilla chips provided an edible way to scoop up the extra lettuce and tomatoes that accumulated at the bottom of the glass. For $12 it was probably a more generous helping of ceviche than you would get elsewhere for the same price. L ordered the lunch special of beef empandas with a side order of rice and beans (arroz y habicheulas) for only $7. The empanda was ridiculously huge, covering nearly the entire plate. It was certainly a good value for $7, but the size was frankly frightening and we didn’t expect it to be very good. However, the beef was surprisingly tender and tasty, making for a nice empanada. The rice and beans were passable, and tasted very, very strongly of pork. However, the real draw was not the food, as can be seen below. At least that’s what we called it. Along Route 187 there are a plethora of small food shacks, most of them catering to locals and beachgoers. It being a weekday when we hit the beach (or maybe because it was February), most were closed. However, as we drove along the highway our eyes were caught by the following sign “We have cold coconuts!” Of course, that was all we needed to turn around in the nearest driveway and speed right back. The sign belonged to a small roadside shack, with a stack of coconuts and an expansive grill area set up. 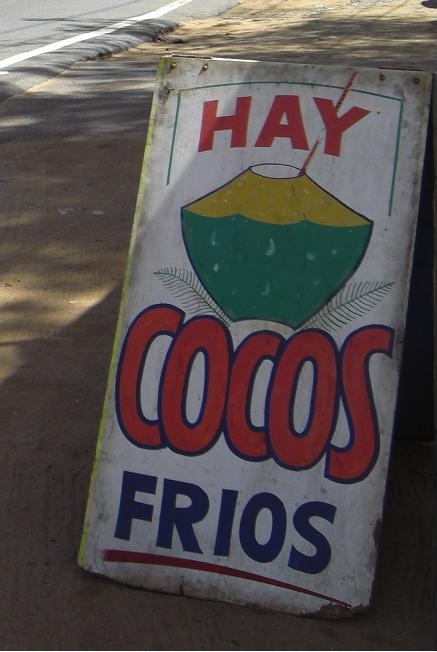 We sidled up to the counter and ordered a batch of cocos frios, one for each member of our group. 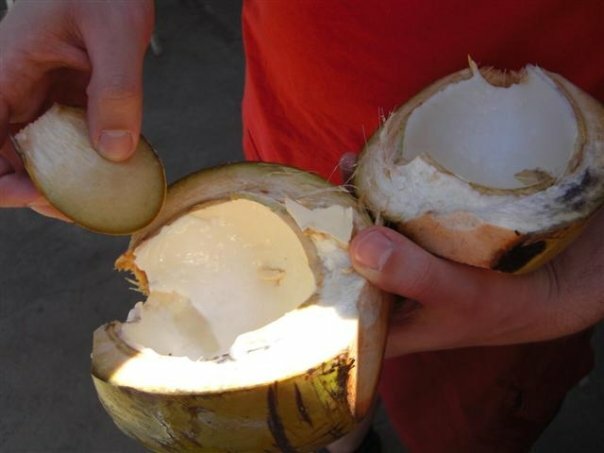 The coconuts had a small hole cut in them, with a straw to drink up the sweet coconut milk. The coconuts provided delicious and refreshing drink for a hot, humid day. The best part however, was when you had finished the milk; at this point you brought your coconut over to a silent fellow with a machete whose only job, ostensibly, was to split the coconuts open. Doing this, he also chopped off a sliver of the husk to use as a scooping spoon for the coconut meat. The coconuts were quite young, so the meat was not very ripe or coco-nutty. But the experience in itself was worth the stop. Some of our group additionally ordered alcapurrias (a steal at $1) – spicy ground beef inside a hush-puppy like fritter which got rave reviews. I am quite disappointed I have neither a photo of the shack or the machete man (I could have sworn I took some). Mofongo is one of the national dishes of Puerto Rico, usually prepared as a sizable cake of smashed savory plantains, mixed with garlic. The dish has West African origins, but today is known as a quintessentially Caribbean meal. So, when we arrived in Puerto Rico we knew we had to sample our fair share. While in Puerto Rico we stayed in Old San Juan, but our exploration to find some authentic Puerto Rican cuisine led us into the San Juan neighborhood of Condado, an upper-middle class residential district with some ritzy nightclubs and shopping. Bebo’s, however, was anything but. The expansive, sparse interior looked more like a high school cafeteria than a restaurant, with bunches of tables packed in together inside a simple rectangular room. The only decoration was a TV on one wall showing a Caribbean-league baseball game between two of the Panamanian squads. But we came for the food, not the ambiance, and things didn’t start off too well in that department. M, always a lover of mango-was excited to learn they made fresh mango smoothies – but disheartened when they told us they had “run out of it” for the night. This would be a constant theme, as during the course of the evening they would tell us they had run out of goat, mango, a number of their daily specials, as well as mojitos – which in rum-obsessed Puerto Rico is nothing short of a cardinal sin. We had to have dinner, though, so M settled on chicken-stuffed mofongo, garnished with tomatoes, all for $9. It was good and quite filling, but the flavors were a little over-mixed for his taste. The garlic, plantains, and chicken all seemed to run together, with no one flavor really emerging from they fray. To offset this he ordered a fresh pineapple smoothie (since they were out of mango), which was great, but it really wasn’t enough to make up for the mofongo’s blandness. L had a lechon asado (roast pork) sandwich with swiss cheese, which came on a nice crusty roll. The roasted pork was flavorful, but a little dry and the garnishes of lettuce and tomato were all wilted. All in all, the sandwich was above-average and the price was right at $5.95. Of the main dishes at the course, the mofongo and pork sandwich were the relative winners, with negative reviews coming in on the tamarind BBQ chicken (“too sweet”) and the pork knuckle (“too bland and fatty”). However the highlight of the table were the salty plantain chips. Curiously, these came garnished with French dressing. We were sadly disappointed by Bebo’s. Even though it was full of locals, the lackluster food did not impress us. And it certainly wasn’t enough to make up for the inconsistent service and the fact that they had run out of nearly everything by the start of the [early] dinner service. But not deterred, we searched for another local mofongo-making haunt. When local after local recommends a place, you know the food has to be good. Before we left for Puerto Rico, a few of our sanjuanero friends implored us to go to this place, and when we finally got there to take a gander at the menu, a woman stopped us and said, “You have to go here! My family and I come here every Friday.” Can’t get a much better recommendation than that. When we came back that evening for dinner, we were treated to one of our finest (and cheapest!) meals on the island. El Jibarito’s decor was in stark contrast to many of the other Old San Juan restaurants we had visited over the past few days: simple and unpretentious. 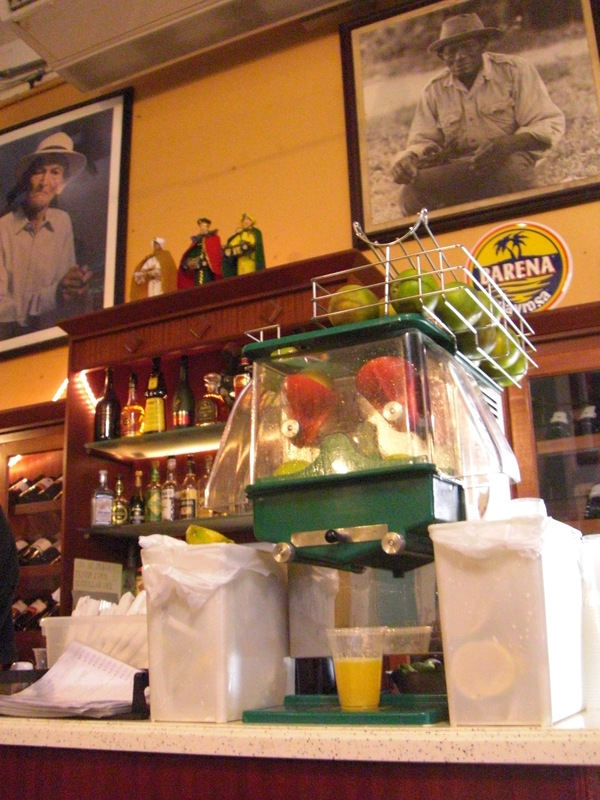 Old photos of famous Puerto Rican musicians graced the far wall, while the small bar and rotating dessert fridge filled up the other side. Photocopies of the handwritten menu served as our ordering guides, leading us to two conclusions: they change their menu often, and they put more thought and effort into their food than the decor. M had the $9 “chicken in a pot” (which came on a plate), a perfectly-cooked chicken leg and breast garnished with grilled onions and green peppers. The dish came with two free sides, a small standard green salad and some of the excellent grilled sweet plantains that the Caribbean is famous for. The chicken was perfectly-done, falling off the bone the instant you touched it with a fork. It wasn’t that spicy, however, so we got some salsa picante for the table. I (M) in particular was happy to find out they didn’t water it down for the Americans – the salsa was as hot and spicy as they could make it, which went just perfectly on the chicken. The flavor combo of the spicy chicken, peppers, and the sweet plantains all flowed together well, each complimenting the other just enough to maintain the coherence of the meal, but also the independence of each aspect of the dish. L had grilled garlic shrimp with mofongo. The shrimp were super-fresh and jumbo sized. The dish came with five and that was more than enough to make a meal. They came smothered in the classic Aji-li Mojili (garlic and chili sauce) which was excellent, and the perfect complement to the shrimp. The side salad that came standard with all entrees was a one-off and consisted mainly of iceberg lettuce. Again, we encountered French dressing, already on the table in a Wishbone bottle. However, the mofongo at El Jibarito is the star. It is garlicky, rich and came neatly shaped in a little tower, like flan. By the time my entree came out the mofongo was getting a little cold, but it was so good I did not mind much. To finish off the meal we ordered some of the house-made Tres Leches (which had unfortunately run out), so we opted for a miniature cherry-topped cheesecake – a simple and tasty treat. By the end of the night, we and our group were satiated and happy. El Jibarito is the real deal. We can see why people come here night after night. We’re back from Puerto Rico – food updates to follow. We plan to update our Puerto Rico food finds in series (one post each Saturday) rather than all in a row, to avoid plantain overload!